MMS DECEMBER 2018 76 mmsonline.com FIVE-A XIS MACHINING When it is time for finish machining, the part is held entirely by the screws from underneath rather than being pinched or squeezed, which enables the light finishing cuts to take place without distortion compromising the overall accuracy. Of course, there is a reason that the company is willing to make these kinds of investments in fixturing and workholding. In regard to the aluminum aerospace part in Figure 3 on page 75, Mr. Holmes says that just a few years ago, he would have had to build elaborate fixtures with jack screws and take 20 minutes to load the piece. "And now we've virtually eliminated that," he says. "We're able to hang it out there, rough five sides of the part, and produce a f lat finished surface to mount the next operation on." That word, "eliminated," represents a much greater value. Full Circle Take a look at the photo on page 77. This is a part for another aerospace assembly that Linda Tool produces by the hundreds each year. The reason it can produce this number is because the company has realized another way of letting the machining cycle do more: circle-segment tools. As an alter- native to face milling, swarf milling or ballnose milling—all of which have unique challenges and advantages—the company uses circle-segment Linda Tool mates its custom fixtures to a modular zero-point clamping system with receivers by Lang and Erowa, which allows the entire pallet and workpiece to be placed in and removed from the machine quickly. When it's time for finish machining, the part is held entirely by the screws from underneath rather than being pinched or squeezed, which allows the light finishing cuts to take place without distortion compromising the overall accuracy. Custom fixturing created by Linda Tool, attached to Lang and Erowa receivers. 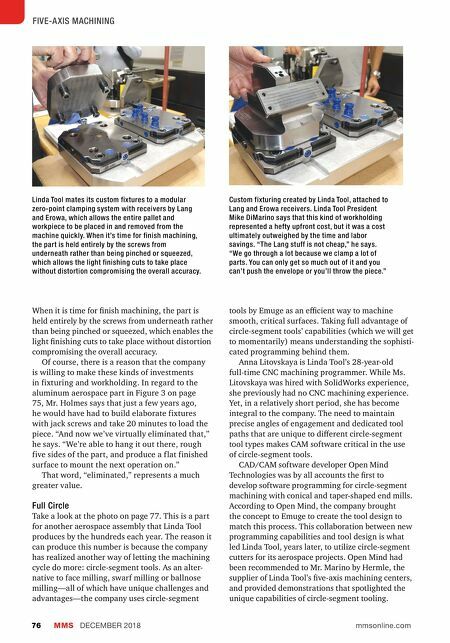 Linda Tool President Mike DiMarino says that this kind of workholding represented a hefty upfront cost, but it was a cost ultimately outweighed by the time and labor savings. "The Lang stuff is not cheap," he says. "We go through a lot because we clamp a lot of parts. You can only get so much out of it and you can't push the envelope or you'll throw the piece." tools by Emuge as an efficient way to machine smooth, critical surfaces. Taking full advantage of circle-segment tools' capabilities (which we will get to momentarily) means understanding the sophisti- cated programming behind them. Anna Litovskaya is Linda Tool's 28-year-old full-time CNC machining programmer. While Ms. Litovskaya was hired with SolidWorks experience, she previously had no CNC machining experience. Yet, in a relatively short period, she has become integral to the company. The need to maintain precise angles of engagement and dedicated tool paths that are unique to different circle-segment tool types makes CAM software critical in the use of circle-segment tools. CAD/CAM software developer Open Mind Technologies was by all accounts the first to develop software programming for circle-segment machining with conical and taper-shaped end mills. According to Open Mind, the company brought the concept to Emuge to create the tool design to match this process. 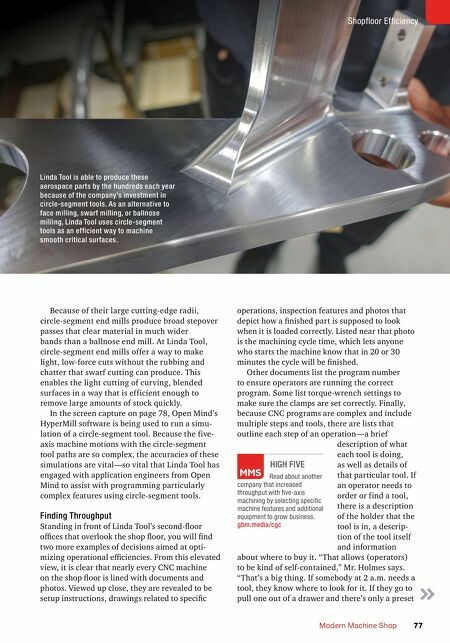 This collaboration between new programming capabilities and tool design is what led Linda Tool, years later, to utilize circle-segment cutters for its aerospace projects. Open Mind had been recommended to Mr. Marino by Hermle, the supplier of Linda Tool's five-axis machining centers, and provided demonstrations that spotlighted the unique capabilities of circle-segment tooling.